An alluring archetypal signal caller who might sneak into the first round of the Draft. Started every Cowboys’ contest since the eleventh game in 2014 as a freshman. In 2015, Second Team Academic All-Big 12. In 2017, All-Big 12 Second Team and one of three finalists for the Jason Witten Collegiate Man of the Year award. During career, recorded 13,618 passing yards, 92 touchdowns and 9.4 yards per attempt. Established over 50 all-time passing marks at Oklahoma State. At 6-foot-4, 230 pounds, prototypical size with well-built and sturdy frame. Posses the physical traits and football IQ that suggest NFL success. Strong, calm and consistent leader on the field and in the locker room. Under-rated athlete who produced video game numbers. Adequate arm strength with accurate ball placement. Good feel for pass rushers and slides and moves well in the pocket while keeping eyes downfield. Anticipatory pitcher and throws teammates open. Seldom took snaps under center in an up-tempo spread passing attack. Scouts concerned about playing in a quarterback friendly offense under coach Mike Gundy and benefited from an NFL caliber duo of wide receivers: James Washington and Marcell Ateman. Holds onto the ball too long in the pocket and remains focused on first read while staring down target. Without question, an organization will covet the former Oklahoma State star’s skill set. Four-year starter who commanded offenses at two schools. Began career at USF and played in 17 games for Bulls: Transferred to Western Kentucky and sat out the 2015 campaign. Named starter in 2016 and designated Second Team All-C-USA over past two seasons. Produced back-to-back 4,000-yard crusades and recorded a 63:15 TD-INT ratio. Noble performance in the Senior Bowl, completing 8 of 11 passes for 128 yards and a touchdown. NFL size at 6-foot-5 and 224 pounds with a live arm as well as poise and composure in the pocket. Former high school pitcher who drives the football downfield. Nice combination of arm strength and accuracy. Terrific touch on deep balls. Worthy athleticism: Buys additional time with his feet. Maintains balance in his stance and squares shoulders. Rhythm passer with compact release and throws a tight spiral. Looks off defenders, uses eyes to disguise objectives and locates targets in stride. Under duress, remains calm and keeps moving the chains. Scans the defense and makes good progression reads. Tough final season at WKU after coach Jeff Brohm left as well as top receivers Nicholas Norris and Taywan Taylor. Did not make a lot of tight window throws. Developmental prospect in the NFL. Two-sport star in college. Member of Wolfpack’s track team: ACC Champion and All-American for the 4x100 relay squad and named All-ACC in the 100- and 60-meter dashes. Special teams terror: Returned 88 kicks for 2,171 yards and two touchdowns and fielded 11 punts for 135 yards and a touchdown. In 2016, snatched 43 passes for 525 yards, averaging 12.2 ypc. As a junior, first campaign as full-time starter in the backfield and gained 1,112 yards on 197 carries and scored 12 times, including four runs over 45 yards. Recorded best 40-yard Dash at Combine among running backs. At 5-foot-8 and 198 pounds, dual threat ball carrier with a powerful build. Displays good elusiveness and flashes lateral ability. Smaller ball carrier, who locates holes in the defense and explodes downfield with top-end speed. Good hands and pass catcher. Plays with a toughness and employs an unpleasant stiff-arm. Difficult to tackle in open field. Willing blocker despite limited size. Must lower pads upon impact. A nice complimentary runner who can help a franchise in the backfield and on special teams. A FCS superstar in the Patriot League. As a freshman, instant playmaker with 1,838 yards rushing and 23 touchdowns and captured the Jerry Rice Award. As a sophomore in 2015, Conference Offensive Player of the Year. As a junior, First Team All-American with 1,799 yards rushing and 19 touchdowns. Recorded three consecutive seasons over 1,600 yards on the ground. Senior campaign stalled by hamstring injury and only played in seven games last year. During career, scored 74 touchdowns and averaged 153.7 yards from scrimmage per game. Notable athletic score results at Combine opened more eyes of Draftniks and personnel departments. Compact frame at 5-foot-9 and 205 pounds. Great cutting ability, stunning lateral agility and bountiful balance. Good vision and ankle-breaking jump cuts. Easily changes direction and rapidly hits top speed in the open field. Absorbs hits, stays low and remains on feet. Underrated power and versatile competitor. Good pass catcher and willing pass protector. Humble athlete with high football IQ. Level of competition may concern some clubs. Athletic profile prefigures a productive career as a satellite back. Last year, catapulted among the best receivers in college football and declared for the Draft after three campaigns on campus. As a junior, led Red Raiders in receiving with 93 catches for 1,429 yards and 10 TDs while averaging 15.4 yards per catch. Recorded over 100 yards in five games and double-digit catches four times. Finished second in the Big-12 in receptions and yards. Named Second Team All-Big 12 and semifinalist for Biletnikoff and Earl Campbell Tyler Rose Awards. Stupendous deep speed and home run hitter who attacks safeties. Tremendous “go” route runner who was uber productive when targeted vertically. Tracks football extremely well and corrals ball with strong hands. Avoids tackles and turns slants and crossing patterns into huge chucks of yards. At 5-foot-10 and 181 pounds, quick feet, rapid acceleration, terrific vision and easily separates. Despite less than ideal size, tough and physical competitor who commands the middle of the gridiron. Transitions from catcher to runner in the blink of an eye. Catches ball in traffic. Easily identifies holes in the zone. Started at the “Y” position at Texas Tech. Might have difficulty with physical defenders. 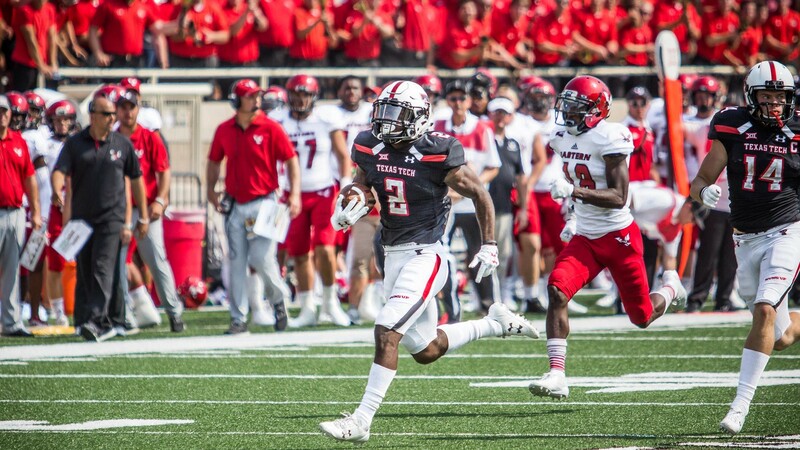 Limited route tree and experience in the Red Raiders’ scheme. Needs to run north-south more often instead of east-west. Follows former Texas Tech playmakers Wes Welker, Michael Crabtree and Jakeem Grant into the NFL. An astute scouting department will identify Coutee as a under-the-radar prospect in the Draft. Under appreciated prospect by most Draftniks. In 2014, established new school marks as a freshman with 82 receptions and 899 yards and named Honorable Mention All-Big Ten. Meager sophomore and junior campaigns. Resurfaced in 2017, Second Team All-Big Ten after recording 53 catches for 857 yards and nine touchdowns. Finished career as Penn State’s all-time leader in receptions and second in yards (2,842). Both parents served in Marine Corps and instilled discipline. A four-year starter, redshirt senior and team captain last year. Well liked by coaching staff and teammates. Shined in East-West Shrine Game practices and excelled in 1-on-1 drills during Senior Bowl week. At 6-foot-1 and 205 pounds, played predominately in the slot. Disciplined, savvy and precise route runner who creates late separation in route with good handwork. Makes sharp breaks out of cuts with good footwork. When ball is in the air, tracks it and fights for ownership with strong mitts. Identifies soft spots in zone coverage. Good body control and creates yards after the catch. Willing blocker in the run game. In the right offensive scheme, likely to enjoy a very productive career that maximizes strengths. After a poor draft evaluation process, stock falling quickly and looks like a late-round selection. Last year, Florida State had an inexperienced quarterback and was a team in disorder. Scored 16 touchdowns on only 65 receptions (25%). Led ACC in receiving touchdowns with 10 (2017). Terrific physical tools with a rare combination of size and athleticism. Long frame and solid build. Very good body control and concentration. Stupendous red zone target with large catch radius at 6-foot-5 and 228 pounds. A determined competitor, fights for the football with strong hands and good leaping ability. Boxes out opponents with size and resolve. Dominates defenders at the catch point. Wins jump balls deep down the field. Corrals ball away from body. Tracks and adjusts to football in the air and contorts figure to make difficult catches. Asset in the run game: Enjoys blocking. Looks like a prototypical X-receiver. Does not create a lot of separation from defenders. Needs to develop as a route runner. Improvement required in-and-out of breaks and cuts. Merely totaled 21% of team’s passing yards. On Draft day, only 21-years old. One team likely falls head over hells with physical traits and upside.